2018-10-22 Accepting orders till november 5th. There is some very nice stand alone device, which for me the PCB takes too much hp's in my Eurorack. This is a great box, there should definitely be a clone done...someone help! Given the above, I decided to build a 'clone' of the Simmons analog Clap Trap. I will further refer to it as the Clap'a'Trap ('a' from analog). I've been able to lay my hands on a bunch of NE566, so I can build quite some. Humaniser has been built in, not copying any of the clone's circuit on the forums. Auto and Humanizer leds are buffered not to draw 20 mA from a CMOS device. Audio, Synth(trigger), Footsw and Out are ESD protected. 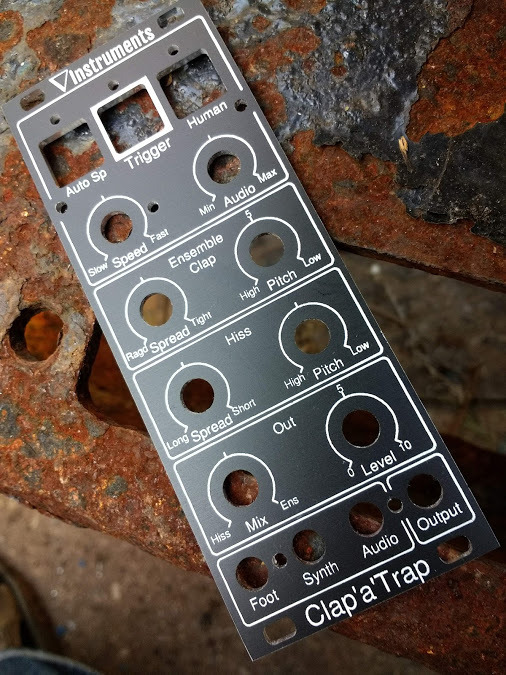 It's all on a single PCB, thus able to be put in an depth limited Eurorack. I haven't decided yet whether I will sell the PCB with or without SMD (about 140 components). That will probably depend on the requests. 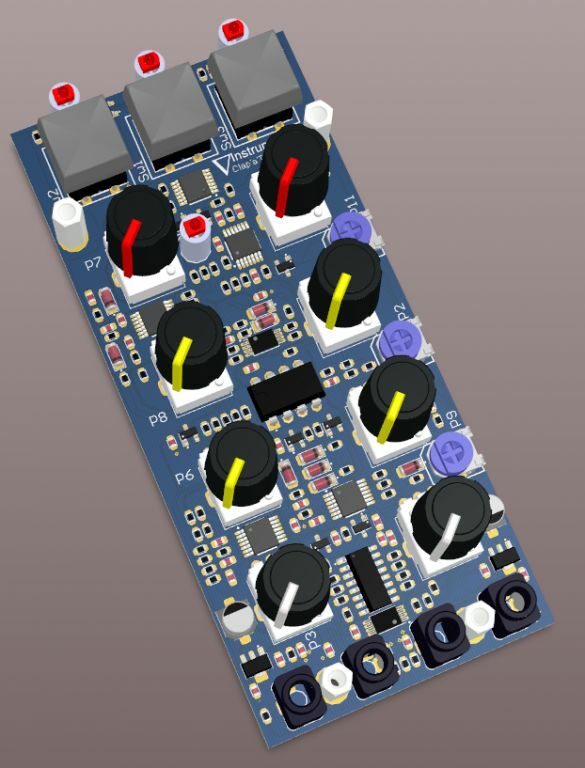 Proto design is done and PCB has been ordered today. Given the other projects I'm running, I expect it to be available in about 8 weeks (exclusive summer holidays). I will provide the FPD and Overlay design files, so you can decide whether it's a FrontPanelExpress panel or manufactured by e.g. Julian who was so kind to provide a FP for evaluation on the MP7 'fully loaded version'. Pls feel free to start a request list. As I'm on a businesstrip till june 8th, I can not reply very fast. The Minipops project was a bit large, and out of my price-range, unfortunately, but I'd definitely be up for one of these! Wow! Claptrap season on MW?! Definitely interested but my SMD skills are crap at the moment. Either way, exciting! Not sure how useful it will be as modular given there is no trigger or CV inputs? The synth input is the trigger input. That's how the Simmons one was labelled. very much in it for one of these! I'm in for one. Maybe two. I will update that when I'm back home. @Boogie Could you explain the purpose of the inputs? any estimations on price tag? There are three kinds of trigger inputs. Then there's the audio input which triggers on external audio. Indead there are no CV inputs. Will depend on the number of interested people and mainly SMD populated or not. I discourage to use this project as a first trial for SMD soldering. It's all 0603 (that would still be doable) but then there are multiple chips with a 0.65mm pitch meaning just some 0.3 mm isolation between the pins. Looks great. I would love a PCB/panel set. Will you be creating a specific thread for that? I would be interested in a PCB/panel. I'm pretty comfortable with 0603 parts so I wouldn't need a populated PCB. Once debugged I'll calculate the costs and place the results in this thread. I'm pretty comfortable with 0603 parts so I wouldn't need a populated PCB. Let's see where this thread leads to. Anyhow, if the proto is OK, I might sell some unpopulated PCB's and provide a comp refdes printout. The density does not allow for well readable RefDes placement on the PCB. If I have to run a next 5 pieces after initial debug, There will be some PCBs left for SMD population. I a bunch of people would buy the thing, I will do a SMD populated PCB in addition. 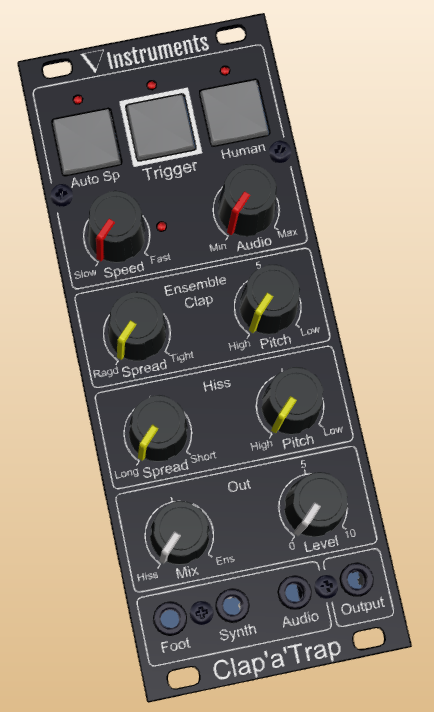 As with the minipops - what do you think about an expanded version with more cv options for modulating the parameters? I'd be down for an unpopulated PCB and panel. Let's do a poll and see where it goes. I'll start a list to keep track of all requests.